The music exec is helping make it possible for everyone to take campus tours. In an era marked by hateful and harmful social media bullying, DJ Khaled — the music industry recording artist and exec with 4.4 million Instagram followers—is attempting to turn the negativity on its head and pay it forward with the platform he’s built. Khaled has partnered with the education non-profit Get Schooled on a series of Snapchat college campus tours to solve a major logistical challenge in the quest to provide good access to higher education: many high school seniors who intend on going to college never get a chance to visit prospective campuses. “By harnessing DJ Khaled’s expertise and the Snapchat platform, we are able to connect more young people with the support they need to make college a reality,” Marie Groark, Get Schooled’s executive director, said in a press release. The organization has released 20 tours over the last two months, including University of Michigan and Columbia University, amassing more than 400,000 views. 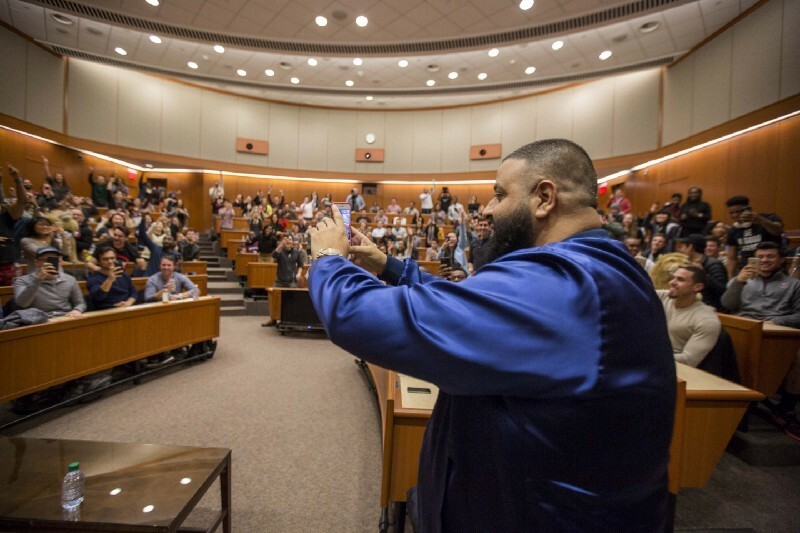 On Dec. 9, Khaled spent time at Harvard Business School, where he taught a class based on his new book, The Keys, and participated in a Q&A with a media entertainment expert and professor. Harvard is just one stop on the Get Schooled Snapchat College campaign. Khaled has signed on as a national spokesperson for GetSchooled, and his involvement includes a monthly Keys program. Interested in hearing more about Khaled’s Keys to Success? Watch Khaled in conversation with Thrive Global founder Arianna Huffington.